Industrial manipulators for bags | Scaglia Indeva S.p.A.
An INDEVA® allows you to pick, lift, move a bag effortlessly. 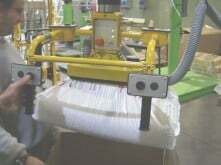 Handling bags in repetitive and frequent work cycles and empty a bag this way is very natural, with no buttons to press and keep pressed. This is why an INDEVA® is defined “extension of human arm”. The INDEVA®s allow bag emptying /filling in a very ergonomic, safe and natural way. Scaglia Indeva designs and manufactures custom gripping tools: for handling bags the manipulator can be equipped with a gripping tool using mechanical jaws. The INDEVA®’s with vacuum gripper are the safest and easiest way to handle bags.